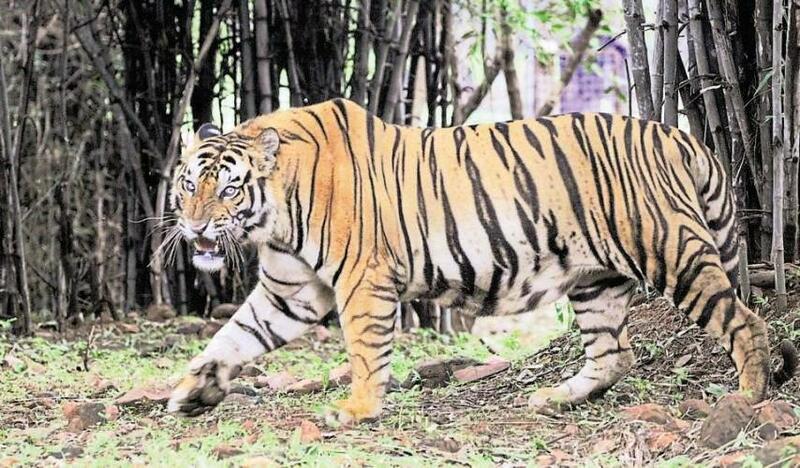 Kanha Tiger Reserve’s famous tiger Bheema died on Sunday, a week after it was wounded in a tussle with another tiger in the Mukki range of the reserve. After the injury, Bheema was shifted to an enclosure, but despite the best efforts of veterinary doctors, it died in the afternoon, said forest officials. “When our staff found him, he had multiple injuries. He was very weak as he had not been able to hunt. He could barely walk. We shifted him to the enclosure for treatment. We called two veterinary doctors from Jabalpur, but despite their best efforts to save him during last one week, Bheema finally died on Sunday,” Kanha park superintendent PK Verma told HT. Wildlife conservationist Sarosh Lodhi said Bheema was famous for his tourist-friendly nature, due to which many were able to photograph him. “He had a large build, due to which he was named Bheema. His actual name was T-28”, he said. Kanha, spread over Mandla and Balaghat districts, has witnessed a rise in tiger numbers. In 2010, camera trap photographs captured images of 37 adult tigers and two cubs, and based on this data, a projection was made for the entire Kanha tiger habitat, which revealed there were roughly 60 cats in the reserve. According to the latest camera trap photographs, there are a minimum of 83 tigers in Kanha. However, this year, Kanha has reported very high tiger mortality, with 11 tigers losing their lives — the highest for any tiger reserve in the country. Wildlife lovers have expressed their concern by the seemingly unprecedented surge in tiger mortality in the state. Overall, 29 tigers have died in MP this year, with three in the last one week. According to National Tiger Conservation Authority (NTCA) data, 90 tigers have died in the country this year, with nearly one-third from MP alone. October 28: Carcass of a male tiger found in Mukki range. October 22: Carcass of a tiger found in Khatiya range, with all four paws missing.